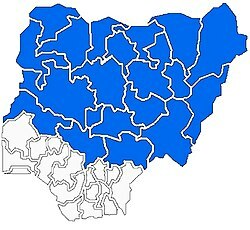 Northern Nigeria was an autonomous division within Nigeria, distinctly different from the southern part of the country, with independent customs, foreign relations and security structures. In 1962 it acquired the territory of the British Northern Cameroons, which voted to become a province within Northern Nigeria. The Fourteen Kingdoms unified the diverse lore and heritage of Northern Nigeria into a cohesive ethno-historical system. Seven of these Kingdoms developed from the Kabara legacy of the Hausa people. In the 9th century as vibrant trading centers competing with Kanem-Bornu and Mali slowly developed in the Central Sudan, a set Kingdoms merged dominating the great savannah plains of Hausaland, their primary exports were leather, gold, cloth, salt, kola nuts, animal hides, and henna. Between 500 CE and 700 CE Hausa people, who are thought to have slowly moved from Nubia and mixing in with the local Northern and Middle Belt population, established a number of strong states in what is now Northern Nigeria and Eastern Niger. With the decline of the Nok and Sokoto, who had previously controlled Central and Northern Nigeria between 800 BCE and 200 CE, the Hausa were able to emerge as the new power in the region. They are closely linked with the Kanuri people of Kanem-Bornu (Lake Chad), the Birom, Gwari, Nupe and Jukun. The Hausa aristocracy, under influence from the Mali Empire adopted Islam in the 11th century CE. By the 12th century CE the Hausa were becoming one of Africa's major powers. The architecture of the Hausa is perhaps one of the least known but most beautiful of the medieval age. Many of their early mosques and palaces are bright and colourful and often include intricate engraving or elaborate symbols designed into the facade. By 1500 CE the Hausa utilized a modified Arabic script known as Ajami to record their own language; the Hausa compiled several written histories, the most popular being the Kano Chronicle. Usuman dan Fodio led a jihad against the Hausa States and finally united them into the Sokoto Caliphate. The Sokoto Caliphate was under the overall authority of the Commander of the Faithful. Under Dan Fodio, the Empire was bicephalous and divided into two territories each controlled by an appointed vizier. Each of the territories was further divided into autonomous Emirates under mainly hereditary local Emirs. The Bornu Empire was initially absorbed into the Sokoto Caliphate of Usman dan Fodio, but broke away after a few years later. Initially the British involvement in Northern Nigeria was predominantly trade-related, and revolved around the expansion of the Royal Niger Company, whose interior territories spread north from about where the Niger River and Benue River joined at Lokoja. The Royal Niger Company's territory did not represent a direct threat to much the Sokoto Caliphate or the numerous states of Northern Nigeria. This changed, when Fredrick Lugard and Taubman Goldie laid down an ambitious plan to pacify the Niger interior and unite it with the rest of the British Empire. The protectorate of Northern Nigeria was proclaimed at Ida by Fredrick Lugard on January 1, 1897. The basis of the colony was the 1885 Treaty of Berlin which broadly granted Northern Nigeria to Britain, on the basis of their protectorates in Southern Nigeria. Hostilities with the powerful Sokoto Caliphate soon followed. the Emirates of Kotogora and Ilorin were the first to be conquered by the British. In February 1903, the great fort of Kano, seat of the Kano Emirate was captured, Sokoto and much of the rest of its Caliphate soon catapulted. On March 13, 1903, the Grand Shura of Caliphate finally conceded to Lugards demands and proclaimed Queen Victoria, Queen and sovereign of the Caliphate and all its lands. The Governor, Frederick Lugard, with limited resources, ruled with the consent of local rulers through a policy of indirect rule which he developed into a sophisticated political theory. The geographical area included in the Northern protectorate included the Okun-Yoruba land of Kabba, Ogidi, Ijumu, Gbede, Yagba, as well as, Ebira land, Igala land fashioned collectively under Kabba Province. The Ifelodun, Offa, Omuaran, Ifelodun and Irepodun areas also Yorubas were fashioned into Ilorin province. Lugard left the protectorate after some years, serving in Hong Kong, but was eventually returned to work in Nigeria where he decided on the merger of the Northern Nigeria Protectorate with Southern Nigeria in 1914. Agitation for independence from the radically different Southern Protectorate however led to a formidable split on the 1940s. The Richards constitution proclaimed in 1945 gave overwhelming autonomy to the North including eventually in the areas of foreign relations and customs policy. Northern Nigeria gained self-government on 15 March 1957 with Sir Ahmadu Bello as its first premier. the Northern Peoples Congress under Bello dominated parliament while the Northern Elements Progressive Union became the main opposition party. The government of Northern Nigeria was modelled after the Westminster system. A premier acts as head of government and presides over the day-to-day affairs of government, while a governor acts as head of state and commander-in-chief of the constabulary. The lower house of parliament called the House of Assembly is composed of elected representatives from the various provinces of the country. The Upper House of parliament, called the House of Chefs, is similar to the British House of Lords. It is composed of unelected emirs of the various Native Authority Councils of the nation's provinces. The governor is head of the state of Northern Nigeria. The office was first established on January 1, 1897. The governor presides over all ceremonial functions and appoints the members of the nation's upper legislative house, the Northern Nigerian House of Chiefs. Richard Dohew, 1954 - ? The highest point in Northern Nigeria is Chappal Waddi at 2,419 m (7,936 ft). The main rivers are the Niger and the Benue River which converge at Kabba province from where it travels southwards ultimately emptying into the Atlantic Ocean. The expansive valleys of the Niger and Benue River valleys dominate the southern areas of the region. To the southeast of the Benue river, hills and mountains which forms the Mambilla Plateau create the highest plateau in Northern Nigeria. This plateau extends to the border with Cameroon, this montane land forms part of the Bamenda Highlands in Cameroon. The great savannah belt of the Great Plains of Hausaland dominates much of the rest of the province. this region experiences rainfall between 20 and 60 inches (508 and 1,524 mm) per year. The savannah zone's three categories are Guinean forest-savanna mosaic, Sudan savannah, and Sahel savannah. Guinean forest-savanna mosaic is plains of tall grass which are interrupted by trees. Sudan savannah is similar but with shorter grasses and shorter trees. Sahel savannah consists of patches of grass and sand, found in the northeast. In the Sahel region, rain is less than 20 inches (508 mm) per year and the Sahara Desert is encroaching. In the dry north-east corner of the country lies Lake Chad, which Northern Nigeria shares with Niger, Chad and Cameroon. The South Western part of the region included Ogidi, Iyamoye, Iyara that have deep forests inter spacing the guinea savannah areas (and borders the forested areas of southern protectorate and as such shared similar rain patterns and given to the cultivation of cash crops such as coffee and cocoa). Kano, the largest of the provinces in terms of population and economy is in the North-Central part of the country. The Kano Native Authority an offshoot of the fula Kano Emirate inherited the ancient trade industries that fuelled the trans saharan trade with North Africa. The Province of Zaria is home to the City of Kaduna, an autonomous capital city that serves as the nation's capital and home to its national institutions. Groundnut and cotton industries in the province of Kano provide the main source of revenue for Northern Nigeria. Tin mining in the Province of Plateau, Steel mining in the Province of Benue and other metal industries in the Province of Sokoto build up the diverse mining industry of the Country. Cement industries in Sokoto and Bauchi and leather processing industries in Kano constitute the main manufacturing sector. Northern Nigeria though an ethnically and religiously diverse state, is an overwhelmingly majority Muslim region. The Hausa, Fulani, and Gbagyi people dominate much of the North Western and central parts of the Country. While the Hausa and Fula are chiefly Muslims, they also have a Christian history, an Ancient Hausa King of Gobir known as 'Mai Sakandami' - the Cross bearer was a Christian long before the coming of European evangelists and a minority Christian Hausas and Fulbe thrive in the North Western Provinces. A small part of the Hausa population also adheres to the ancient religion of Hausa Animism. The Biroms and Ngas of the Plateau and the Tiv and Jukun of the Benue are chiefly Christian, they were converted to Christianity after the colonisation of the country by the British. The Nupe, Kebawa and Yoruba peoples (Kabba, Ogidi, Iyara, Ilorin, Offa, Omuaran and others) occupy the south western parts of the region, these people are also mainly Muslims with Emirate type Native systems that predate the country's existence in the case of Ilorin and traditional king systems for the other Yoruba towns. ^ Ibrahim Ado-Kurawa. "Brief History of Kano 999 to 2003". Kano State Government. Archived from the original on 2010-05-01. Retrieved 2010-09-12. ^ a b "Kano Chronicle," ed. Palmer, pp. 70-72.